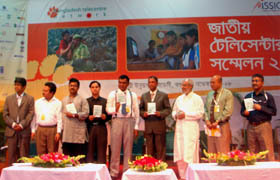 Bangladesh Telecentre Network (BTN) organized the first National Telecentre Colloquium 2008 was held during November 07-08, 2008 at Rural Development Academy, BOGRA. S M Wahid uz Zaman, Secretary, Ministry of Science and ICT, Major General (Rtd.) Manzurul Alam, Chairman, Bangladesh Telecommunication Regulatory Commission (BTRC) ware present in the Colloquium.YPSA’s representatives Abdullah Al Shakir and Vashkar Bhattacharjee attended the event. Vashkor gave a presentation on Daisy (Digital accessible Information System) for the person with disability.The prime objective to organize this knowledge conference is to give a fresh blow to the existing telecentre movement in the country.YPSA is the member organization of BTN.